Don't breed, Don't buy... Adopt a rescued bird! One of our volunteers adopted Peppie, an amazon. While being fostered, it was believed that it would be all right if Peppie was adopted on his own. Peppie’s new mom found him a bit aggressive, but was happy to work with him to gently correct his behavior. One day, she returned to the pet shop, from where he had come, to attend a wing/nail trim clinic. Cocoa was there and when Peppie saw her, both birds went crazy. Later that day, back at home, Peppie started freaking out. Screaming, biting, lunging, and making a strange bird call noise. The behavior persisted for three weeks. It was clear to Peppie’s mom that he was distraught at having seen Cocoa and then being separated from her again. 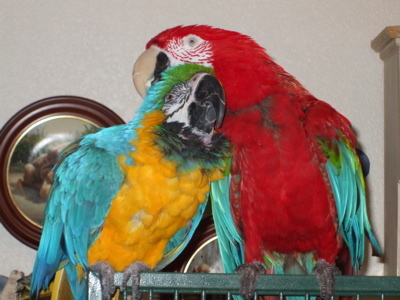 Peppie’s mom called Mickaboo and advised us that these birds could not be separated - they were in love! A few days later, Peppie’s mom picked up Cocoa and brought her home so that the new adoptive parent, who could take both birds, would be able to pick them up together. When Peppie and Cocoa were reunited, sparks began to fly. There were whistles and kisses and, "Hello, how are you?" "Polly wanna cracker?" and "Come here, come here!" 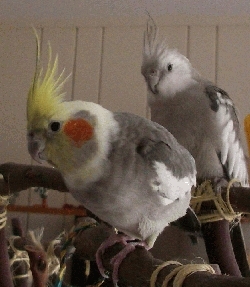 Peppie said "hi" repeatedly while Cocoa blew kisses to him and began to preen him. It was a true fairy tale and it was priceless. All this “aggressive” bird needed was to live happily ever after with his princess. The economic downturn that has plagued our country for almost a year now has dramatically changed the lives of millions across the country. Every day, our friends and loved ones who lose their jobs are forced to give up their previous standard of living and even their homes. Luckily, humans by nature are resourceful and are able to rebound if necessary; pets, however, are at the mercy of owners. Numerous news articles describe the grisly state of foreclosed homes that are found with abandoned pets that died of starvation and thirst after being locked inside. Allie Phillips, director of Public Policy at the American Humane Association, estimates, with an average of 8,000 houses foreclosing every day, approximately 15,000 to 26,000 more animals are in danger of losing their homes daily. The American Humane Association is working overtime by providing the “Foreclosure Pets Grant” to organizations that are willing to help our furry and feathered friends in need. Fortunately, Mickaboo has recruited loyal volunteers who open their hearts and work round the clock to ensure that every bird finds a loving home. According to Claudia, fellow Mickabooligan, a realtor in the Santa Cruz Mountains who was recently checking an empty property found a young Blue and Gold Macaw. The realtor was afraid that the local shelter would not be able to provide for the young parrot, since she knew they had been recently overwhelmed with massive amounts of abandoned animals. Out of the kindness of her heart, the realtor drove to the site every day for several weeks to make sure the macaw had food and water. 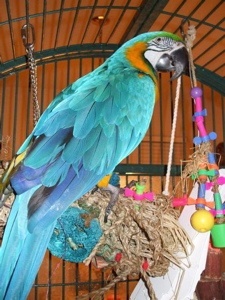 Mickaboo stepped in after learning about this poor macaw and provided her with a vet check up and a loving new family. 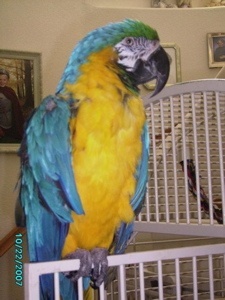 This young macaw named “Mac” was lucky to have been found by such a caring realtor. Mickabooligan Francie rescued a Moluccan Cockatoo named “Jepetto” that was abandoned by his owner over a year ago. After his owners lost their home, Jepetto was left with no choice but to reside outside in a tree. Under the love and care of Francie, Jepetto has since healed but the experience left him emotionally scarred. Although times are tough, we must work together and not abandon our friends that cannot fend for themselves. I urge you all to encourage your friends and family to adopt a pet that has become homeless due to the recent economic crisis. You can also help by volunteering for Mickaboo or donating money via our website. Helping a bird that cannot help itself is an amazing gift you can give. The happiness our pets bring us today will surely help us weather the ravages of this economic storm. Link to volunteer or donate money. Link to application to adopt or foster a bird. 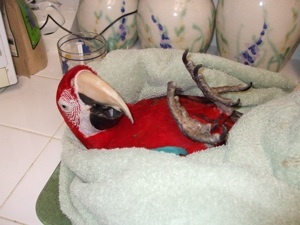 Since the extraordinary increase in birds needing placement and the experienced care required for larger birds, Mickaboo has been unable to accept Macaws and Umbrella Cockatoos for several months. But just recently, this moratorium was sadly expanded to perhaps the most gentle and social of companion birds, cockatiels. For whatever reason, Mickaboo has seen a substantial increase in the number of cockatiels coming in. Certainly the economy and foreclosures are partly to blame. 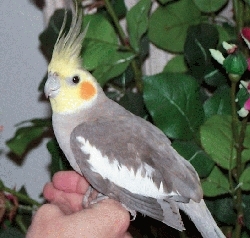 We had to announce a moratorium on accepting cockatiels, as of midnight on Wednesday, June 17, 2009. Despite efforts to find ways to increase our capacity and supply of foster and adoptive homes, we could not meet the need, and had no choice but to begin turning away cockatiels in need of homes. On Saturday, June 27th, we held a special "Small Birds Adoption Fair" at Andy's Pet Shop in San Jose, to introduce people to some of our cockatiels, budgies, lovebirds, and finches. We gave two pre-adoption classes and offered interested persons the opportunity to complete most of the qualifications for adoption in one day. Thanks to Lissa Shoun for offering her shop, and to the volunters who came out to help with teaching classes, phone screens, set up, clean up, bringing birds, and answering questions. 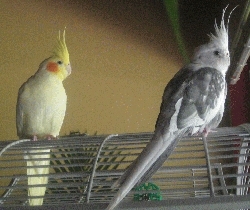 Cockatiels Who've Been Waiting the Longest for a Forever Family and a Home to Call Their Own! 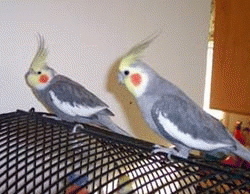 Below are the cockatiels who have been with Mickaboo the longest. Click on their pictures to get to their individual stories and a link to their adoption coordinators. Did you know that by donating that old car, truck, RV, or boat, you will be making a vital contribution toward rescuing birds in need and avoid the headache of selling a used vehicle? Mickaboo will receive 70% of the net proceeds from the sale of the vehicle while you save money at tax time! Our representatives at Car Program LLC will make all the arrangements for towing, title processing, receipt distribution, appraisal if required, sale at auction or dismantler, accounting and distribution of sale proceeds to Mickaboo. Your car doesn't have to be in working order and can generally be picked up at any location in the continental U.S. and Hawaii. To donate your vehicle, call toll free at 1 800-237-5714 and designate Mickaboo Companion Bird Rescue as your charity. I had never considered having a king pigeon (or any pigeon) as a pet until I met a tame one, Gurumina, who had been surrendered by her owner to SF Animal Care & Control. I was there doing my volunteer shift socializing the rabbits and rats and guinea pigs and she kept bouncing up and down in her stainless steel cage. She sounded like a bowling ball in a clothes dryer. Shelter volunteers usually don't handle the birds but Gurumina wanted attention and when I opened up the door to her cage, she stepped out on to my arm, surprising me both with her weight and her charm. Rather than let Gurumina be euthanized (which is what usually happened to king pigeons), I decided to find her a home. At the time, I had two parrots, two cats and a dog and was feeling full up (ah- the good old days), but figured I could foster her until I found the right adopter. With Mickaboo's help, I did. Her adopter, Shafqat, has this to say, "Having a king pigeon is a nice alternative to having a more demanding pet. My Gurumina is low maintenance and independent. She quietly follows family members around the house while we go about our business and is lovely to look at on top of that. I'm very glad I have her in my life, she's a peaceful and pleasant presence." Since meeting Gurumina, I've adopted six and fostered almost one hundred pigeons. So beware, pigeons can be addictive. King pigeons are domestic and can’t survive in the wild. They’re bred to be eaten as squab and so are big-bodied for maximum meat yield and white (white feathers are a byproduct of the pink skin consumers prefer in meat birds). Bay Area animal shelters get quite a few in (several a week in SF) because they get away from backyard breeders or people see them for sale in live food markets, feel sorry for them, buy them and set them ‘free’- a gesture most don’t survive (and that only rewards the breeders). Once free, king pigeons stand around, not sure what to do or where to go and are quickly killed by hawks, dogs, cats, and cars. The few lucky survivors make it to shelters where adopters are scarce and euthanasia likely. As a breed, king pigeons are calm and very adaptable. They're alert but not prone to panic. Their energy level is much lower than that of parrots and they tend to have really great leisure skills- lounging and napping and watching more than being busy, busy, busy. I think of parrots as being hot and spicy while pigeons are cool and mellow, maybe even boring to some. Pigeons will interact with you and some like ringing bell toys or adopting cat toy balls as surrogate eggs. They don't talk and while they are flashy strutters, I don't know of any that dance. Pigeons are quiet with the male courtship cooing/moaning being the main vocalization. They do coo or trill at you sometimes but they never scream or yell. While quiet and mellow, they are still full of opinions and personality and each is an individual. Like when adopting any bird, you have to accept them as a cherished guest in your life and not try to change them or force them to be something they're not. Most of my pet pigeons will give me some quality snuggle time when in the house but prefer not to be handled when they're outdoors (like it's our little secret). Louie, who I've had for almost two years, does not want to come indoors or be handled ever and I respect that wish. I leave her be and am content to love her from afar. If you keep your pigeon indoors as part of the family, two or even one alone, given enough attention, is fine. They need a home base such as a large dog crate, flight or Amazon-size cage. The less 'out time' they get, the bigger their home base needs to be. They'll walk around more than fly (and never climb) but will likely pick out a high perch or two (atop kitchen cabinets is a favorite) as well. Poop can be managed (especially on hardwood or tile floors) with meal feeding and some designated hangout places or controlled with pigeon pants. 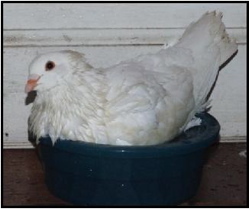 Pigeons ‘hold it’ while sitting on their eggs and so have the potential to be potty-trained. Pigeons don't bite (though they may peck or pop you with a wing if they have a point to make) and they don’t chew so your woodwork and walls and electrical cords are safe. They do seem to love walking on keyboards (Note to self: Buy an old keyboard or two on next thrift store visit). Frances, a sick and terrified shelter king I brought home to nurse a couple months back, surprised me by becoming completely tame. I've nursed lots and would have swore he was an aviary-only bird but he now spends his days outdoors in my backyard loft but his mornings & evenings in the house with me, three cats, a dog and three small parrots. Usually he gets along fine with everybody but once in awhile he’ll get in the mood to attack the cats (!) and I have to put him in his crate for a time-out so they aren’t terrorized. I absolutely adore hearing Frances pitter-pattering around the house. He'll do his own thing for a while (like deciding to take a bath in the dog's water dish) and then comes looking for me and always brings me a smile when he comes. It's extremely easy to keep king pigeons as outdoor pets. They can't be safely flown (they are easy targets for hawks and cats) and so must be protected in an enclosure. Kings are birds of leisure though, and don't need a lot of flight space (though they do, of course, need room to move around). They require a safe, predator-proof enclosure with some protection from weather extremes but, because they are soft-bills, it is safe to contain them with wood and galvanized wire- no stainless steel required. If kept outdoors, it's nice to have a small flock of four to eight birds and I highly recommend a walk-in aviary because it's easier to clean and fun to go in and interact with them. They say no one ever wished for a smaller aviary so plan it to be as big as possible. Minimum size for four birds would be at least six feet long (horizontal space is most important) by four feet deep and five feet high and the bigger the better. They'll spend their time bathing (pigeons love water), preening, lounging in the sun, eating, watching the sky, napping, socializing and courting. Every four to five weeks, couples will lay a pair of eggs (which should be replaced with fake for pigeon birth control) and take turns sitting on them. Pigeons are extremely devoted to their family and usually (though not always) mate for life. They adjust well to life in the human world and make really easy, sweet pets. I highly recommend them! There are currently more than 30 king pigeons in need of adoption. 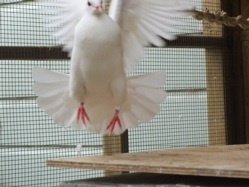 For more information about adopting a King Pigeon, visit www.Mickacoo.org. To read more about what Elizabeth does, visit her blog at www.RescueReport.org. What Color Should I Paint My Bird Room? "I want to paint my bird room, but need a color for it.” A simple question, to which I expected to read a few, rather plain, replies like, “Off-white works well” or “Try muted greens." As attentive as I am to full-spectrum lighting, elaborate playstands, a healthy diet, and creative foraging methods, it had never occurred to me to give any serious thought to what color to paint the walls of a bird room. The email question continued with, “I am open to lot of colors and want something to brighten the room.” And, believe it or not, the current light blue in one room posed a problem when a couple of the emailer's birds saw it as an “extension of the sky” and tried to fly into it. I had that problem with my kitchen skylight, but had never thought about blue paint as a similar hazard. She finished with, “Obviously it will be a gloss so I can clean it easily.” Ok, I was becoming convinced that ‘what to paint the walls of a bird room’ was a worthy and interesting question. But I was completely unprepared for the series of charming suggestions and creative possibilities that followed. Light yellow and gold stripes, walls with alternating color and pattern, the latest cutting-edge materials with an array of technical benefits, and, my personal favorite, “washable wallpaper -patterned in free-falling different-colored feathers against a white background.” Ok, that last one inspired me to revisit this delightful and informative thread and present it here! "My cockatoos absolutely love their paint striped light yellow and gold room. Two walls are paint striped, and two walls are in the gold color. Doesn't make them over active at all. I used semi-gloss so that I could scrub it. It touches up nicely too." "We had our bird room done with 'American Earth' clay wall covering. It's kind of like stucco, but is a totally natural clay based material. The color is ground up minerals mixed in with the clay. We absolutely LOVE it. It absorbs water and then evaporates it back into the air later, so we don't worry about overspray when bathing the conures. It's also fairly sound-dampening, and if one of the birds were to eat some it'd be safe. Finally, what I like best, is if a piece of the wall gets messed up, you just mix it with some water and smooth it back over! We really like how it came out, and we hired a Mickaboo volunteer who specializes in itto do the work. Top notch!" 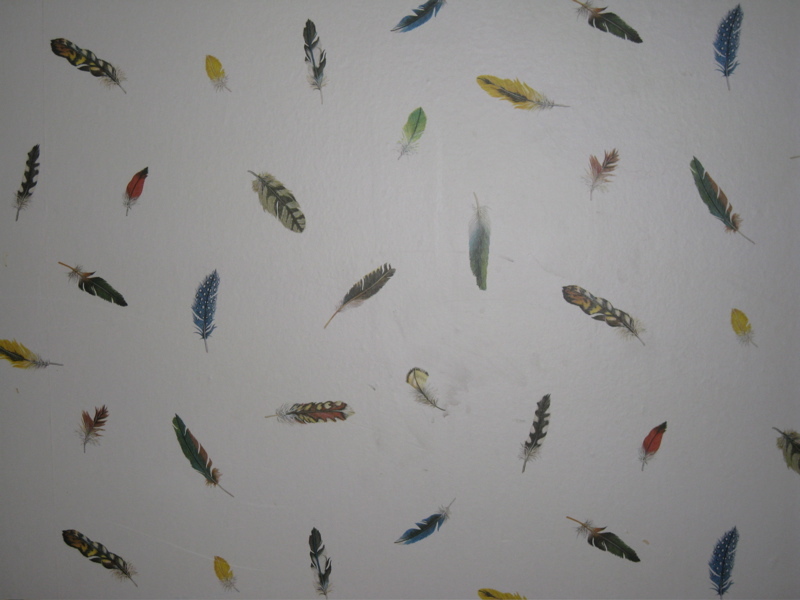 "My bird room is a washable wallpaper -patterned in free-falling different-colored feathers against a white background." Mix dry ingredients. Make a well in the center. In a separate bowl, mix all wet ingredients, including peels. Pour wet ingredients into the well and mix. Fold in nuts and berries. Pour batter into a greased and floured loaf pan (or 8'' square cake pan). Bake for 45 minutes to an hour. Cake is done when a skewer inserted in the center comes out clean. Serve plain to birdies; humans may wish to add vanilla ice cream. Help Raise Money for Mickaboo! 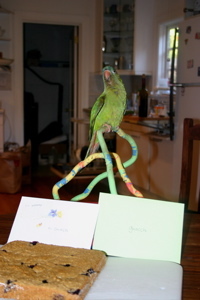 If you use credit cards, you can help raise money for Mickaboo by just continuing to use them. All you have to do is Sign up at escrip.com! It's that simple! Note: Safeway is the ONLY merchant that will not send $ to Mickaboo. If you buy online, consider using the escrib online mall to increase the percentage donated to Mickaboo-- Amazon is a notable merchant there! Our historical escrip numbers suggest that if we can get 1000 people to sign up, Mickaboo could benefit by $6000 a year! It doesn't cost the person anything but a bit of time to sign up (once). A person can live *anywhere* in the United States. So, tell your friends and family... everywhere! We have two online silent auctions in progress, ending at midnight of July 31. 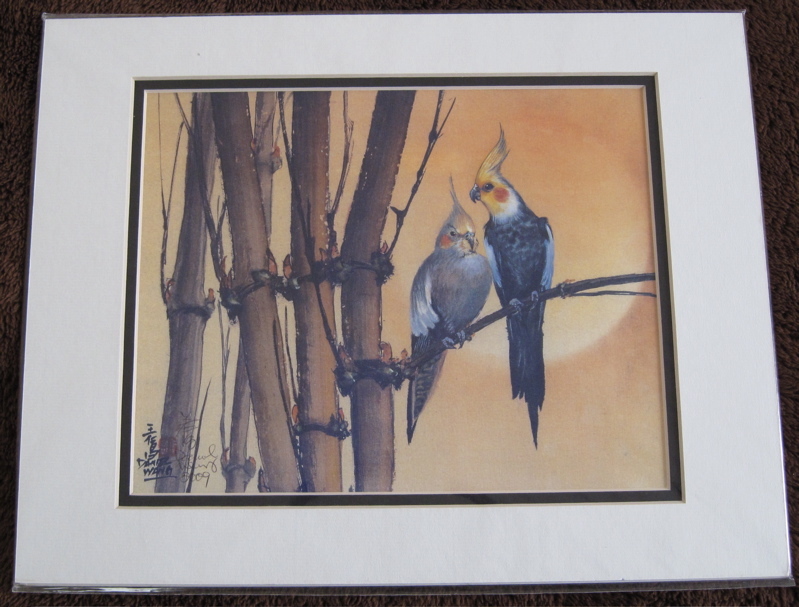 Item #1 is a print of a signed and dated cockatiel watercolor by award-winning artist Daniel Wang. See here for a more detailed description and to bid. 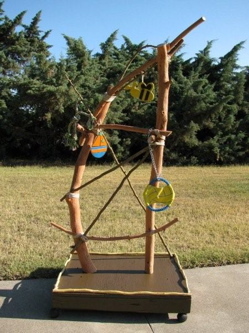 bird playgym made by one of our volunteers. See here for more dimensions and to bid. up this playgym from its location in Arbuckle, CA. All proceeds will go directly to Mickaboo. Enjoy, and Good Luck! Max and Rico are now inseparable - that's Rico grooming Max in the picture to the left! It wasn't always like that. The tale of Rico and Max is one of a small miracle and many wonderful people. Here is their story (told by Shelley Buttler). 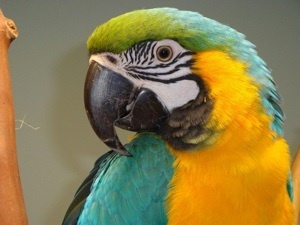 Sometime after I adopted a Blue and Gold Macaw, named Mackie, I discovered that he had a very serious avian ailment called the Papilloma Virus. The disease is only contagious to other birds, but sorely limits the birds that could come into my home. While reading stories on the Mickaboo website, I came across the story of Rico, a Greenwing macaw also afflicted with the Papilloma Virus. I felt that Mackie needed a buddy and here was another bird with a similar situation. So I contacted Mickaboo about Rico. The Macaw Coordinator told me that she had just been looking into placing Rico into a life-time sanctuary due to his illness. So far he had been in Mickaboo for 18 months, and nobody that had shown interest in him seemed to fit Mickaboo’s qualifications. While I in no way thought I was “qualified”, I did have my experiences with Mackie and knew what I had to look for and was well aware of the risks of taking in another afflicted bird. I immediately sent in my adoption papers, took the first available Basic Bird Care Class, had my phone screen, home visit, and in the meantime made arrangements with Rico’s foster mother, Kelly, to visit Rico. I couldn’t wait to see that great big red bird in person! I walked into Kelly’s home and she coached me on how to behave around Rico. I wondered why. Then she told me his terrible story. Rico was brought to her by a friend who had “purchased” him from “a friend of a friend, of a friend, and so on.” He brought Rico to Kelly because he was very concerned about Rico’s health. Thank God he did. Kelly was able to bring Rico into Mickaboo where he was immediately rushed off to the vet. Rico was in really bad shape. He had a tumor on his tongue so big, he could hardly eat. He had bleeding, ulcerated tissue hanging from his vent. He had several infections and was very close to death. Multiple antibiotics later and after surgery on his mouth and vent, and Rico was on his way to recovery…at least physically. In addition to Rico’s health issues, he had been kept in a rabbit cage so small he couldn’t stretch his wings. It was filthy and totally unsuitable for any bird, not just one of the larger species of macaws. He was terrified of hands and brooms, and was extremely fearful of anyone who moved in his direction too quickly. Kelly told me that she had allowed Rico’s original owner (the friend of a friend…) to come visit him to see how he was. They entered her home and Rico started screaming in terror. I don’t remember how Kelly got them out of her home, but she never allowed them to come back. Rico’s name was changed as mention of his original name would send him into an immediate panic mode. I was finally approved to adopt Rico and he came to live with me on September 21, 2007. I was so excited! My hope was that he and Mackie would become fast friends. Of course there was quarantine to go through and I wanted to work with Rico before I introduced him to his new friend. It was unknown if Rico could be held. Kelly had given him the time and space he needed to heal from his ordeal. Not long after that wonderful day, I got a telephone call from Kelly telling me that another macaw had come into the Mickaboo system. His name was Max and he was a Blue and Gold who was being tested for the Papilloma Virus. Would I be interested in this bird if he indeed was diagnosed positive? Without hesitation, I said YES! There were about 2 weeks of total agony waiting to find out if this bird too had the disease. I was torn, because I really didn’t want him (or any other bird to be tested positive) but knowing I could help another animal in need was almost as strong. Max did indeed test positive for Papilloma and he made the shuttle through Mickaboo volunteers to make it to my home. Max arrived exactly one month and one day after Rico: October 22, 2007. 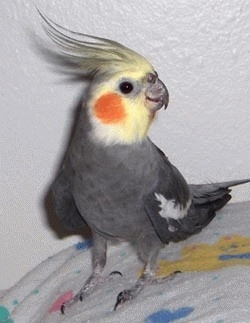 I don’t know a lot about Max’s story, but I do know that he was a breeder bird that was being given to a family member. This family member had taken him to the vet and had decided to have Max put down if he had Papilloma. Somehow Mickaboo found out and stepped in to save his life. Max has other health issues including a respiratory problem and hardening of the arteries. All serious, but all manageable with proper care. When Max arrived, his breathing was not good. He had casings enveloping most of his tail feathers (at least towards the tips) much like what you see on pin-feathers. He was very stressed but very sweet. 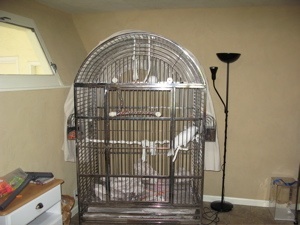 Rico had surgery in April of 2008 on his vent and I was told to keep the two birds separated. I couldn’t even last 1 day of this. Rico would cry pitifully begging me to allow his friend to come back to him. I did and it was the best medicine for both of them. Neither one of these two ever wanted anything to do with Mackie. It’s strange how that happens. I had all the best intentions when I enquired about Rico and God brought Max to us, to Rico. These boys had a hard life; they had a separate life. Now they are together in their forever home where they will stay, together, until their passing or mine. I cannot explain the joy that these birds have brought to my life. They came to me with illness and fear issues and have overcome so much. I can now sweep the floor around Rico without him going into panic mode. He will even step up onto the handle without much coaxing! Max’s breathing has improved immensely and his fearful “Stevie Wonder” dance has abated except under unusual circumstances. As one person said to me not long ago, “what are you feeding that glow-in-the-dark macaw?” Their stunning appearance belies the fact that they are sick. Both birds have an incurable illness, but one would never know it by looking at them. They have both come to love and trust me which is the best reward I can think of. Never have I been happier than when the two of them sit side by side raining kisses down my face. Thank you Mickaboo! You’re the best! 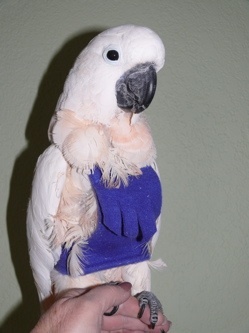 Enter Your Bird to be Featured in the 2010 Mickaboo Calendar! Our wonderful 2009 Mickaboo Calendar featured birds of different species and we voted to determine which lucky birds would get their pictures included! 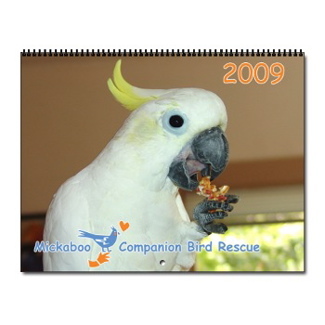 For next year, The Mickaboo Bird Rescue Companion is having a contest to determine which birds to feature in Mickaboo's 2010 calendar! We need thirteen pictures, all of different bird types. Here is how you can submit your picture for the upcoming calendar. 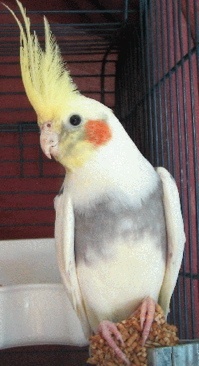 Eligibility: Pictured bird must be a Mickaboo bird - either a current foster or one adopted from Mickaboo. Picture: Digital picture must be 2300 pixels wide by 1800 tall at 200 dpi. No pictures of birds in dangerous situations (like being outside without a harness or unprotected by a cage-like structure). Story: Picture must be accompanied by a short story about your bird.The story will be published along with your picture! 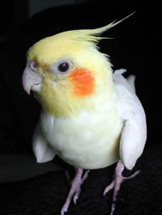 Your short story of five sentences or less should include your bird's name and its type, such as lutino cockatiel, blue-crowned conure, Timneh african grey, Dusky pionus, or sulphur-crested cockatoo. Submission: Send your story and picture to pr@mickaboo.org, and with "2010 Calendar Contest" in the subject line. Stories and pictures must be received by August 31, 2009. Judging: The five best entries in each of the thirteen categories (to be determined after submissions have been received) will be named and put to a public vote. Public voting instructions will be published in our October 2009 newsletter. All decisions by the judges as to eligibility or other contest decisions will be final. Questions:Send questions to pr@mickaboo.org, and put "Calendar Contest Question" in the subject line. For details, see our Upcoming Events and Classes page. Cost: $10 for one service for one bird; $15 for both services for one bird. Appointments are strongly recommended and must be received by noon of the Saturday before each clinic. Mickaboo has a booth at the Fair. Come and join us to learn about bird care and the birds in our care! The current list of FREE Basic Bird Care Classes is on our Upcoming Events and Classes website page. email class@mickaboo.org to sign up. Your donation really helps - become a Mickaboo supporter! 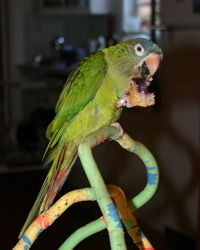 Mickaboo Companion Bird Rescue is a nonprofit organization. We are not government funded, working solely on private donations and adoption fees, and staffed entirely by volunteers. 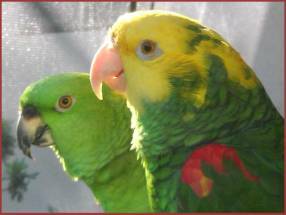 Your donations go directly to providing medical care for our needy rescue birds.